MetalFoam is a highly porous disc produced by a proprietary sintering manufacturing process. Powdered Copper and Silver (Cu/Ag) are melted into a sacrificing porous base with the metal taking the foam's shape. The new tremendously porous foamed metal has now increased it's surface area by over 5000% compared with flat metal of the same weight. How does it purify my spa? Lifeguard MetalFoam is a proven media for the destruction of bacteria and virus. Tests performed by the University of South Florida in Tampa show the effectiveness of this amazing new purification product. How does it work In my spa? Simply drop the "flying saucer" into the skimmer or into the center hole of your spa's filter. As contaminated water passes through the MetalFoam's huge surface area, it is exposed to the Cu/Ag metals and contaminates are destroyed. 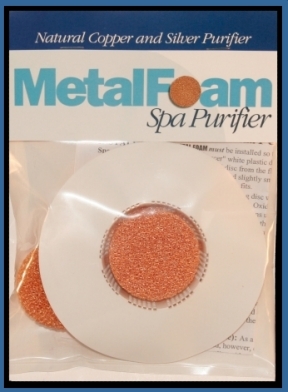 MetalFoam will work in conjunction with ozone or by itself to sanitize your spa. What is the big advantage? 1) Water quality! Since Chlorine/Bromine levels are significantly reduced, water is much more pleasurable to bathers. 2) Return on investment! An average of 80-90% reduction in chemicals will pay for the inexpensive MetalFoam Spa Purifier very quickly. 3) A healthier alternative! Minimizes or eliminates exposure to chlorine/bromine, or other dangerous chemicals. 4) A Better, Healthier way purify your spa! Once a month simply remove the MetalFoam and backwash with a hose and reinsert. The MetalFoam unit should be replaced about every 3 to 5 months depending upon usage. Are oxidizers (chlorine and bromine) still required? Yes, MetalFoam will reduce chlorine/bromine usage up to 90%, however a low dosage of an oxidizer is required primarily to "clear" the water. MetalFoam will eliminate algae, bacteria and virus but will not "burn up" sweat, body oils, and other organic contaminates. You should lightly oxidize your spa after every usage with 1/4 to 1/2 cup of household bleach or with one tablespoon of a non-chlorine shock such as Potassium Monopersulfate. This will polish the water of sweat by-products and then dissipate quickly, leaving the spa virtually chemical free by its next usage.